Compare Kids' Pull-Along Canopy Wagons: Radio Flyer Ultimate Comfort or Step2 All Around Canopy Wagon? Kids' pull-along wagons are usually multi-function mini transport vehicles that require no fuel and are pulled by an attached handle. They provide toddlers or preschoolers with an enjoyable ride as the wagon is pulled by a walking adult, be it in the back yard or garden, in a park or in the country away from traffic. These wagons often provide multiple riding options, such as the 2-seats, flatbed or just for storage configurations, combining the best in versatility and comfort to fit your family's changing needs. If you are planning to get one for your little ones, you should make sure that you select one that is equipped with safety seat belts, a removable canopy so it can easily be stored or carried in your car's trunk, and that has enough weight capacity to carry safely your kids. This article will compare Radio Flyer Ultimate Comfort and Step2 All Around Canopy Wagon which were not just the most popular kids' pull-along wagons among Amazon customers at the time this article was written, but they had also received excellent reviews from most Amazon buyers (an average rating of 4.5 stars each out of 5 stars!). Selected Kid's Pull-Along Wagons on Amazon. The height (H) given here is the height of the wagons without the canopy (note that since the canopies of these two wagons are removable and foldable, they do not present a storage problem, and therefore the canopy height is not critical). Radio Flyer Ultimate Comfort has removable padded seat covers providing additional versatility and comfort. Step2 All Around wagon seats are not padded. Radio Flyer Ultimate Comfort has an expandable rear storage bag that folds away when not in use. It also has storage packets behind the padded seats. Step2 All Around features large "trunk" storage and also storage under the seat when seats are flipped into the flat bed position. Radio Flyer Ultimate Comfort wagon's UV protection canopy can be removed in seconds with a quick-clip attachment system. Step2 All Around wagon's UV protection canopy can also be easily removed. It is held in place by four poles than can be taken out in under a minute. Radio Flyer Ultimate Comfort wagon has no door. The kids have to step over or have an adult lift them in. Both wagons have a handle that folds over for easy storage. In order to get the 2-year extended warranty with Radio Flyer you have to register the product on the manufacturer’s website. So, which pull-along canopy wagon to buy? The two wagons compared above are both quality products as confirmed by the 4.5 average rating given by Amazon customers at the time this article was written. They are both multi-function wagons good for a variety of use as the seats easily convert into a number of riding configurations depending on your family's needs. They both have whisper quiet wheels for a smooth ride. They both come with easily removable canopies that provide sun protection and that can fold compactly for easy storage or car transport. They both come with ample storage and safety belts. ​Radio Flyer wagon has a weight capacity of 200 lbs as opposed to 75 lbs for the Step2 wagon. 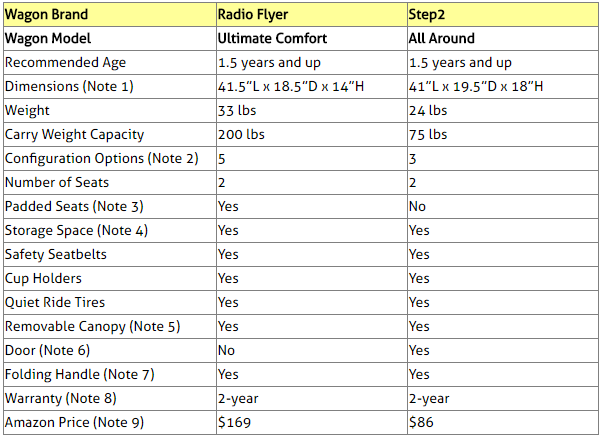 Therefore, if you estimate that the combined weight of your kids and stored goods will be more than 75 lbs, you should consider the Radio Flyer Ultimate Comfort. Also, note that, as described in Note 2 above, Radio Flyer wagon provides more riding options than the Step2 wagon and can be installed with removable padded seats. On the other hand, Step2 has a door that opens and closes while Radio Flyer doesn't, and the kids will have to step over or have an adult lift them in. But given that the height of the Radio Flyer wagon is lower than that of Step2 wagon, it should be pretty easy for the kids to step over the side and get in. Finally, if price is an important consideration, you may want to consider the Step2 wagon as it costs almost half the price of a Radio Flyer wagon. Please click wagon of your choice below for exact price information or to purchase.